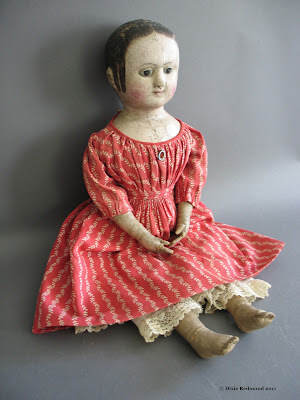 "...Thank you again for taking the long drive with your boys (I know what that is like with small kids) so collectors of cloth dolls can see the beautiful Izannah Walker dolls." There would be no pictures of these Izannahs without the generosity of the Strong Museum. 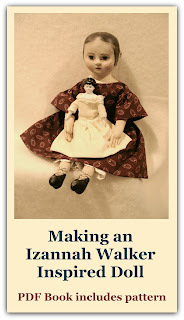 They allowed me to take the pictures with the intention of posting them here on the Izannah Walker Chronicles. Patricia Hogan, a Strong Museum curator, was so gracious and helpful in arranging for the Izannahs to be displayed in a way which showed a variety of angles. Izannah lovers in Tasmania are thankful. The e-mail from Tasmani reminded me that there was one more Izannah doll from the Strong Museum I had not yet posted pictures of. And so here she is. 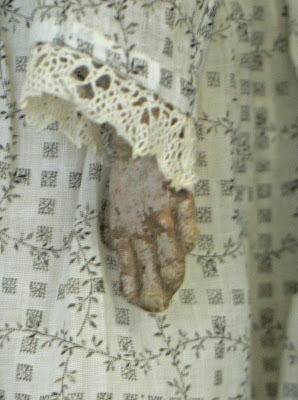 Because she was behind glass and was oriented to the side, I wasn't able to get a front view of this doll. But I did everything I could to get a different angle, short of setting off alarms in the museum. 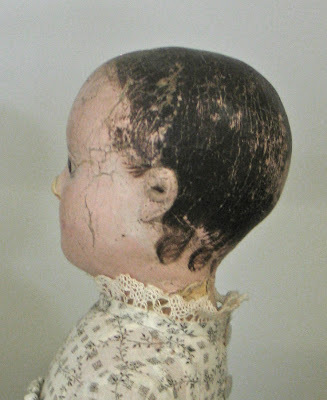 The doll above looks as if she has seen some repainting on the face (compare the face to the back of the neck or the hands, for instance). But she's still sweet. Isn't this viny print adorable? and attached on top of the bodice. and small curls along the neck. The End of the Strong Museum Izannahs!